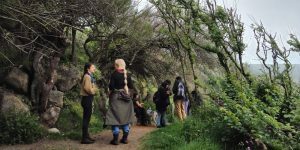 Another great event organised as part of this year’s Groundwork programme of art, the field trip to St Buryan held us entranced by the landscape and our guides for almost six hours. We started our walk in the mizzle at the church that is both commonly associated with the area since the release of the psychological thriller Straw Dogs in 1971. Previously described as the ‘wickedest parish’ of Cornwall, St Buryan hasn’t earned its reputation from the film but from its eight-year excommunication from the church in 1328 following a dispute over control of the religious matters in the parish. It’s more fascinating history was explained byRobin Dowell and James Fergusson as we made our way across the atmospheric landscape to a renowned site littered with evidence of human activity from Neolithic times. We scoured the furrows for flint but found little with our untrained eyes as we progressed towards a number of stone crosses within the parish. The best examples of which were cited in the churchyard and on the outskirts of the village as we made our way towards the coast. The roughly circular remains of the celtic crosses which featured carved figures on the faces were pagan in origin and marked ancient crossing points. We eventually the paths flanked by the high hedgerows bursting with the last intense hues of the bluebells and pinks of the wild campion and plunged into some spectacular waterside glades. As we a weaved our way under canopies of rare Elm the weather improved enough to make a lunch stop amongst the giant rounded rocks of ‘boulder storm beach’, St Loy. Worn smooth by the action of the sea after they had fallen from the cliff face, sometime before the last Ice Age, they made perfect pitches for a picnic. The fascinating archaeological history displayed on the beach as well as the exposed cliffs turned most of us into explorers once our sandwiches had been consumed and we poked and prodded quite happily amongst the fascinating landscape until recalled to make our return. Within the hours we spent with Robin and James, I gained a comprehensive insight into the geological, environmental, archaeological and cultural importance of the parish. The experience left me inspired by the landscape and I will definitely return at some point to explore the previously unknown coastline between Lamorna and Porthcurno. In the meantime, I will be watching the CAST website closely for any future field trips.